A 1"x6" handmade ceramic field tile in your choice of glaze. Does not come with a bullnose edge except by special request. Price is per tile. Grouping with 1"x1" flower handmade tiles is shown for reference only. Free shipping within the United States on all orders over $100. With proper care, this tile may last thousands of years! Can be installed in kitchens, bathrooms, showers and more. Rolled and cut by hand; made from a durable stoneware clay body. 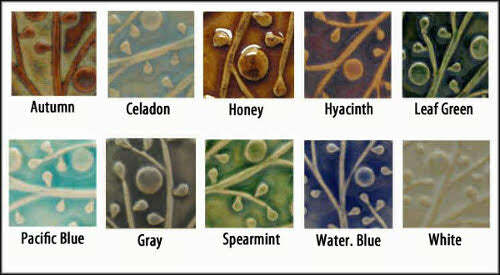 Choose from several glazes, all are lead-free and non-toxic.